Most of us enthusiastic chefs have one piece of cookware we absolutely adore and love. For me, it's my Tramontina "every day" pan. If I could only own one pan for cooking, it would have to be my Tramontina Stainless Steel 3-Quart "Every Day" pan by Barazzoni! Now that I've owned it for a few years, I honestly can't remember how I cooked without it for so long. I know it might seem a little weird to be so passionate about a piece of cookware. And what really makes one saute pan better than another, anyway? I was certainly skeptical when my sweetie David bought me this pan for Christmas - and not because he bought me cookware for the holidays, he always does and I appreciate it! But I didn't know what made this pan so special, and I thought it was just his obsession with all things Italian that made him purchase it for me. 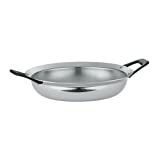 Then I started using the pan, and immediately realized I could probably donate or throw away most of my other saute pans and even some oven-ware; this Every Day pan by Barazzoni did everything they could do, and better. What makes this pan so good? Well, when you first take a look at it out of the box, it visually appears stunning. It's beautifully polished and curved, showcasing all the principles of classic Italian design. It has an elegant finish and a solid weight in your hands that tells you this is a serious piece of cookware. The handles are ergonomically designed and do indeed feel good in your grip, whether turning around on the stove-top or taking out of the oven. Because that's my favorite thing about this pan overall: that you can take it without worry from stove-top to oven making it perfect for all kinds of browned-then-braised preparations. It's oven-safe up to 450F, so that means you can start something like a Shepherd's Pie on the stove top, browning beef and vegetables, and then take it straight to the oven to bake for a crispy top crust. It's large and deep enough to oven-braise roasts, pork belly, shoulder steaks and other tough cuts of meat after searing on the stove top. There aren't a lot of pans I've had that I've felt really safe using in that way or been pleased with the results the way I have been with this pan. I also love using this pan in a lot of other ways. It's big enough to finish off a pasta dish, after cooking down the sauce in the pan. It gets hot enough quickly to lightly fry a piece of fish without it getting burnt or sticking to the surface. You can also set the temperature low enough to slowly cook a chili, or stove-top cook a chicken stew. About the only thing I don't do in this pan is boil water for pasta or make soup and stock; there are some things for which a stock pot can never be replaced! What that does is make it extremely efficient at conducting heat evenly throughout the cookware, and give the pan durability and strength. Really, you have to work with the pan to see how nicely it performs compared to a basic stainless saute pan, or even a wok or cast-iron skillet. And then toss the resulting sauce with just-cooked pasta! How about a ground venison casserole topped with corn muffin mix? Asian stir-fry dishes are also easily prepared in this pan, like this classic ground pork and eggplant. Do you have that one special piece of cookware that you love, and could never be replaced? What would you recommend as a piece of cookware that every home chef should own? You can definitely use metal utensils in this pan, which is another nice feature of it. And it cleans very easily as wel. What a great pan. I've never seen or heard of the brand, but I like it. Can you use metal utensils or do they need to be plastic? The Lillo Due Pasta Extruder by Bottene in review. This professional quality machine will allow anyone to make artisinal extruded pasta in their home kitchen. Review of the Emeril by All-Clad Cast-Iron Reversible Grill / Griddle. This pan is great for getting an outdoor grill flavor and cook on your indoor stove top.